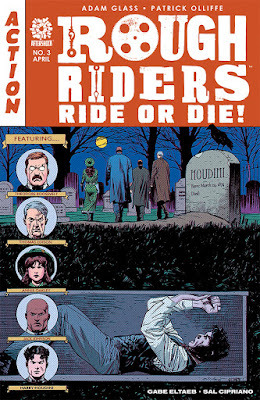 Rough Riders: Ride or Die #3 continues a new tale in AfterShock’s Rough Riders series, which is about a group of American legends who team up to save America from some of its greatest and otherworldly threats. The group consists of Teddy Roosevelt, Annie Oakley, Thomas Edison, Jack Johnson, Harry Houdini, and Monk Eastman. 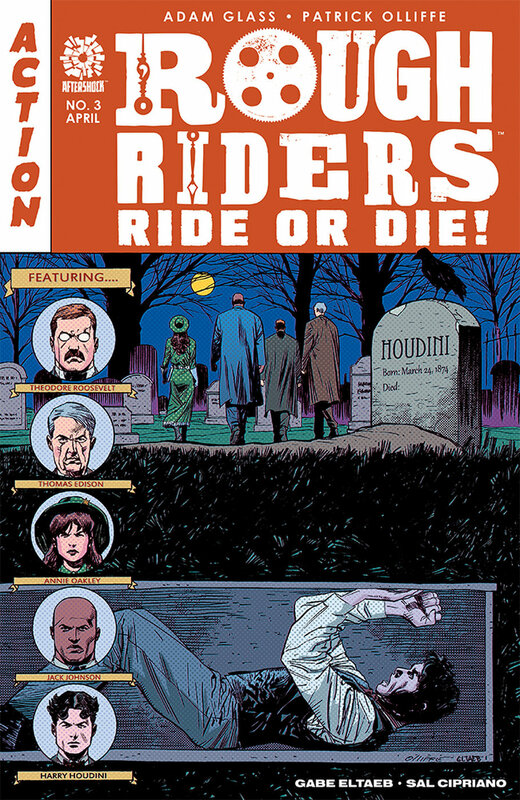 Ride or Die is like a twisted combination of The League of Extraordinary Gentleman and Constantine, pitting these iconic individuals against the darkest of supernatural elements. In Ride or Die, the group joins back up after a supernatural entity was unleashed upon the world during a seance. The only thing that they knew at the time was that the entity was named “The Master.” Houdini calls the rest of the group back together to investigate and stop what is being unleashed on America. Issue 2 saw them join back up from their individual investigations as they learn a little bit more about what exactly they are dealing with, with a blockbuster reveal on the final splash page. Issue 3 sees H.P. Lovecraft propose a rather dire step in order to obtain some much needed information about why one of the legendary Dutch Bokkenrijders has returned to settle a score with a member of the group. Houdini volunteers for this dangerous and possibly deadly assignment, with Jack Johnson staying by his side, while the rest of the group try to follow the Army of the Dead. There is some action and gore in this issue, but its main focus is revealing the events of the past that led to the Bokkenrijders desire for revenge. There is a great deal of supernatural elements in play as it continues to resemble the likes of the Army of Darkness books and other zombie/evil entity themed horror books. The group still has unresolved issues with each other and it shows in how they talk and react with one another, which makes for some good banter. Once again, the final splash page is simply outstanding and will have readers clamoring for the finale. The art from Patrick Olliffe continues to deliver and is simply superb, embodying the gothic look of the era. It is full of heavy black shading, intricate details, linework and hatching. Olliffe displays painstaking detail in the real-life characters, as well as the overall facial gestures and body movements of everyone portrayed in the book. There are several excellent splash pages that are both "electrifying" and gore-filled, as well as some terrific horror and demonic panels. The colors from Gabe Eltaeb continue to perfectly compliment the time period and embody what you would normally expect to see in a horror comic. Specifically in this issue, there are certain panels in which the colors make the artwork really pop. With only one issue left in Ride or Die, I'm really looking forward to seeing how the group manages to save the world and stay alive.